i don’t remember 9/11; i was 5, blissfully making my way through kindergarten. i can’t remember any teacher or family or friend mentioning it, and i bet i didn’t even know where new york is. i didn’t understand what it was, or how the aftermath shaped the world, for a long time. even when i physically visited the memorial, i had a hard time grasping it. such a solemn, quiet place had once been a scene of terror and chaos and despair, and i couldn’t imagine it. i still don’t feel as if i really understand the magnitude of what happened that day, and maybe i never will. maybe my vague sense of compassion and grief will sharpen and focus. or maybe it won’t. in chinese culture (or at least what i’ve been exposed to), at the end of a funeral, guests are given candy. the candy is meant to leave a sweet taste in your mouth as you leave the funeral, a way to temper the loss. in honor of the ones that were lost 15 years ago, i’d like to pay tribute with one of the best ways i know how: with food. 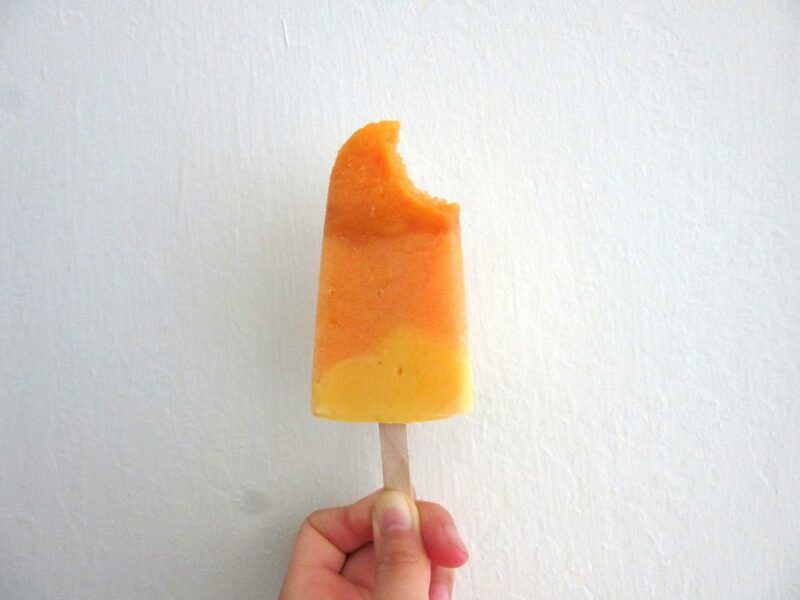 i offer these sunset ombre popsicles, filled with nectarines, cantaloupe and mango. such a silly sweet might not be enough, but i hope it’s a start. Blend the nectarines until smooth; you can add a splash of water if it doesn’t want to blend. Divide between popsicle molds (my molds hold 1/3 cup, so I got 6 popsicles. 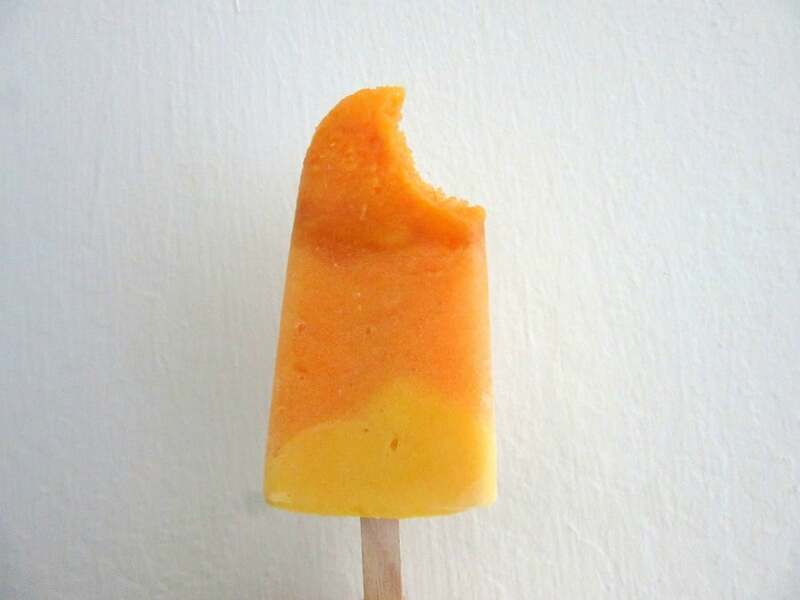 You can also use Dixie cups, but you’ll get more popsicles (never a bad thing). Pulse the cantaloupe (no need to wash out the blender canister) until smooth; you can add a splash of water if it doesn’t want to blend. This might take a while to blend by pulsing, but pulsing ensures that you don’t get too much air whipped into the fruit (the texture gets weird). Spoon or gently pour the cantaloupe puree on top of the nectarine layer. Blend the mango and yogurt together until smooth. Spoon or gently pour the mango yogurt on top of the cantaloupe layer. Place the lids on top of the molds; or press wax paper with a slit cut into it to the surface and put a popsicle stick into each slit. Freeze until solid, then enjoy! I can’t imagine it either – my Mum mentioned that she was at home with us (I was 5 too), when it started showing up on TV. It’s had such a huge impact on not only the people affected but the whole trajectory of the US (and in some ways the rest of the world). Crazy. Ah, thanks for sharing this tribute! I remember the first time I received candy after a funeral and my parents had to explain the purpose of it–I’m glad you found your own way to remember this day. I think I’ll have to try it soon before the warm weather runs out!